If you're impatient like I am, you want Facebook's new Timeline right now, not in a few weeks. Fortunately, all you need to do is become a developer and you're good to go. Note: This is in beta, if you're concerned about privacy or having your entire Facebook history wiped off the face of the Internet, you might want to reconsider before doing this. First, head up to the search field of your Facebook page and search for "developer." You should be given a list of apps. The top one that signifies that it's made by Facebook should be the one you want. 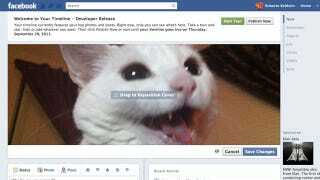 After giving the app permission, you'll be directed to the Facebook developer page. Click on Apps in the top menu bar. You're now on your apps main page. In the left column, click on Open Graph. In the "People can" area add one of the following: Watch, Plan, read, review. In the next area, you'll be presented with a drop down of relevant choices. Choose one and hit "Get Started." Wait a few minutes, head to your Facebook homepage and you should see your invitation to the new Facebook Timeline Beta.